Regenerative medicine utilizes the body’s own regenerative capabilities to heal and restore function to damaged cells, tissues, and organs. These "stem cell therapies" include Platelet Rich Plasma (PRP) and Bone Marrow Aspirate Concentrate (BMAC). These biologic products (PRP and BMAC) can be used as an intra-articular injection to decrease pain, inflammation, and to jump-start the self-healing process. The Mid-Atlantic Animal Specialty Hospital has the ability to offer this cutting-edge therapy using the Companion Regenerative Therapy System (CRT) that can isolate Platelet Rich Plasma (PRP) and Bone Marrow Aspirate Concentrate (BMAC). This system allows our hospital to collect, prepare, and deliver regenerative therapy in-hospital during a single outpatient visit. Platelet Rich Plasma (PRP) uses a patient’s own blood components to stimulate healing in damaged tissues and arthritic joints. PRP is a highly concentrated blood sample that contains isolated cells (platelets) and the fluid portion of blood (plasma). Platelets store numerous growth factors that are released in response to injured tissue. These growth factors are responsible for tissue regeneration. Bone Marrow Aspirate Concentrate (BMAC) Cells have the ability to differentiate into any type of cell. Adult stem cells are found in every tissue of the body including bone marrow, adipose tissue, skin, and liver. Stem cells can activate other surrounding stem cells and recruit additional cell types to aid in wound healing and tissue repair. 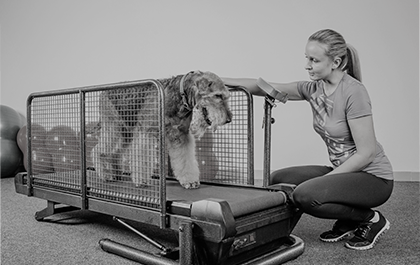 Regenerative therapy is a biologic, holistic and conservative approach that can be used in the treatment of multiple medical conditions in the canine patient. Coupled with physical rehabilitation, regenerative therapy may help improve mobility, function, and minimize discomfort. If you haven’t yet been given a referral from your local veterinarian but think our therapy program would be beneficial, contact us anyway. We’ll coordinate a referral from the primary care veterinarian or specialist you designate.